Geotechnical engineering is a sub-discipline of civil engineering. It deals with the design, construction, and operation of engineering projects while taking into account soil, rock, and underground water. Soil conditions need to be known in order to sufficiently support structures. The environment must also be taken into account in order to reduce health and safety hazards. Engineering geology is important for geotechnical engineers to have knowledge of because they must know the characteristics of the soil and rock formation of the land. Geotechnical engineers are involved in the constructions of earth structures, including dams and retaining walls; foundations, including floor slabs and footings; subsurface facilities, including tunnels and pipelines. The foundation of the Eiffel Tower was very important because it needed to be able to successfully hold a load of about 10,000 tons. The foundation of the structure also needed to be able to last without causing any major problems that would harm or hurt the structure. Any faulty foundation could have caused a toppling of the Eiffel Tower, or cracks that would cause pieces of the tower to fall off. The foundation was dug about 50 feet into the ground and contained about 20 feet of concrete, massive limestone blocks and 2 layers of cut stone. An in-depth analysis of the soil below the Eiffel Tower was completed and necessary to understanding the durability of the soil. Through the analysis, geotechnical engineers discovered some hard soil in the area, but a majority of the soil was soft and not appropriate for the foundation of the structure. It was also noted that this area was prone to flooding which makes the soil even weaker. was poured. This cement was used for the base of the foundation piers. After, large limestone blocks were placed on top of the cement and covered by layers of cut stone. The Eiffel Tower’s base is composed of four legs. In these legs are 2 anchor bolts that are each 26 feet long and 4 inches in diameter. One part of Eiffel’s plan for the foundation of the structure was the placement of a hydraulic jack. The hydraulic jack was used to enable the raising or lowing of the platform to make certain it was level. 1. Eiffel tower: Information on how it was built. (2011). Retrieved from http://www.essortment.com/eiffel-tower-information-built-19756.html. Accessed 5 December 2011. 2. Orfano, F. (2009, September 11). Facts about the eiffel tower. Retrieved from http://www.brighthub.com/engineering/civil/articles/48366.aspx. Accessed 5 December 2011. 1. Leg of Eiffel Tower. http://farm3.static.flickr.com/2039/2531492056_eac05e2c70.jpg. Accessed 5 December 2011. 2. 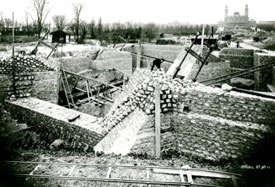 Foundation of Eiffel Tower. http://www.jjonnes.com/asets-et/image-03.jpg. Accessed 5 December 2011.